One of the basic rules of making money in the stock markets is to ensure that you minimize your loosing bets. All your bets in the stock market will not work for you, but it is essential that all the hard work you do with your winning stocks don’t get eroded by a few dud stocks. As Warren Buffet says – “Rule No. 1: Never lose money. Rule No. 2: Never forget rule No. 1”. This is extremely essential if you are investing in the small & mid cap space. 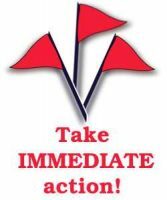 We should be alert & analyze news, corporate actions & annual reports- P/L accounts & balance sheets very closely for potential red flags. Primarily, sudden resignation of auditors or frequent change in auditors & CFOs/top management personnel should be viewed with suspicion. An auditor is responsible for the reliability of company’s financial statements. An unexpected resignation leaves shareholders as well as lenders in the lurch, as they wonder if there is anything amiss in its books of accounts. Auditors currently do not shy away from putting in papers if they find something suspicious in the accounts of a company as some recent regulatory developments have made auditors more conscious. Earlier there were issues with the disciplinary powers of the Institute of Chartered Accountants which have now been moved to an independent body. Therefore, there is a heightened fear among the auditors as in a couple of cases, auditors have also been arrested and sent behind bars. We should also be wary of companies exhibiting supernormal profits in saturated markets or in comparison to established peers. Another potential red flag could be organizations with significant changes in financial ratios year on year. Very high and unusual related party transactions on balance sheets that would include inadequate disclosure of such transactions, fictitious or circuitous transactions would be another major red flag. One should also avoid companies that keep raising funds regularly by diluting equity or where the promoter is continuously selling shares. It shows that either the company is trying to be too aggressive or the business is not self-sufficient enough to generate funds for expansion. It also tells us that promoters themselves don’t value their equity much in the company and a lot of times such promoters have even siphoned out funds from the company. On the other hand one should also avoid companies where the debt on balance sheets increases substantially every year. It is generally seen that sales and profits of such companies grow every year just like their debt, and suddenly one year, they report huge losses and become bankrupt. One should look at debt servicing ratio of such companies. It is calculated by dividing EBIDTA with interest and loan repayment obligation in a year. If this ratio comes down below 1, it means the company has difficulty in repaying its debt and interest obligations from its operating income. On should also keep a tab on the receivables/debtor days of a company. When you see debtor days of a company increasing rapidly, there is a big red flag. This implies one of two things – either the company is trying to increase sales by giving more credit in the market or the company is unable to collect money in a timely manner. It could in extreme cases also indicate fudged sales numbers as both sales & receivables keep going up simultaneously. Sometimes there are companies reporting good profits but paying no or very low tax. While there could be genuine reasons for paying low taxes, one should be vary of such companies. Sometimes a company may be showing fudged profits and increasing its share price because there is no cost for show increased profits. Lastly we should be careful investing in companies with erratic stock price movements without reason especially among smaller, illiquid stocks where stock operators are active. Stock prices move up based on increased profits (P/E ratio) or some business development. When they move up without fundamental reason, they fall on circuits and you can easily be caught on the wrong foot.